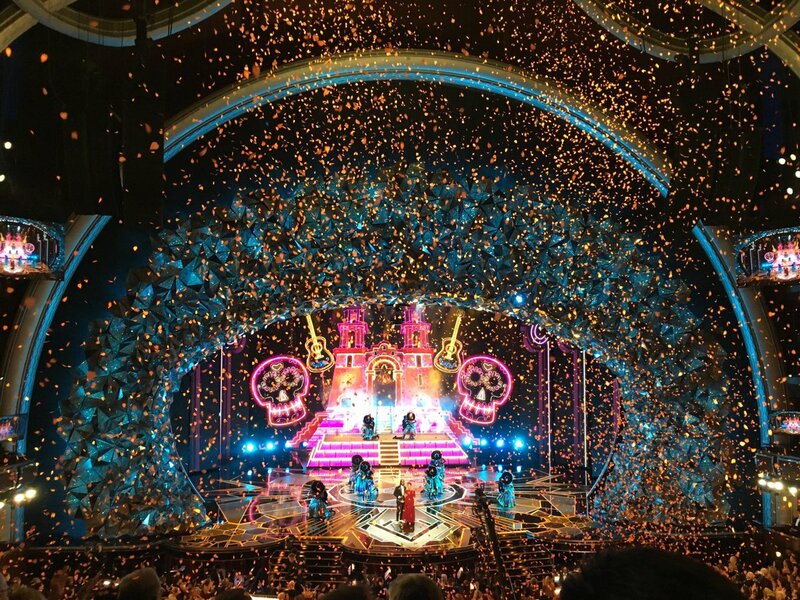 Coco won the top prize at last night’s 75th annual Golden Globes. The film scored two nominations: one for “Remember Me” in Best Original Song and Best Animated Feature. While we hoped the film would walk away with both awards last night, we are incredibly happy for its Best Animated win! 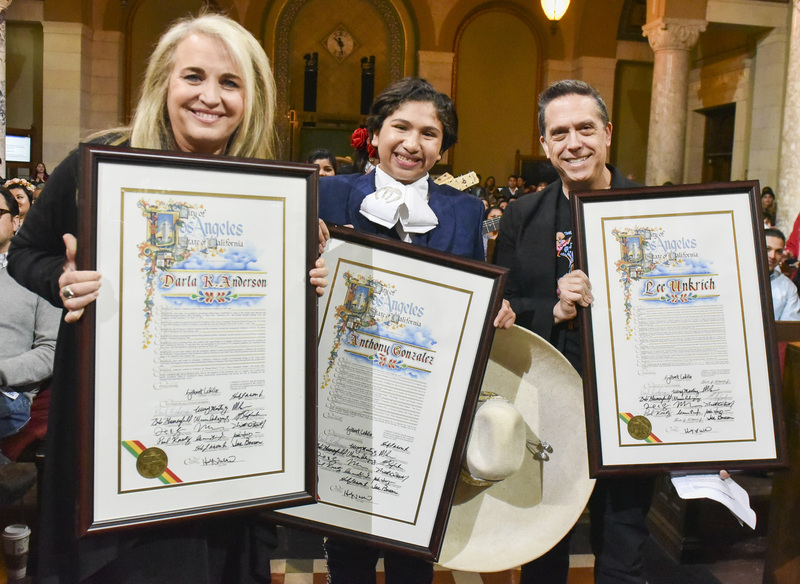 Watch the clip below of Lee Unkrich accepting the Globe, along with co-director Adrian Molina and producer Darla K. Anderson. Coco has made such a tremendous impact, both in Mexico and around the world. This truly is an honor for everyone involved, particularly the Mexican and Latino artists, consultants, and the actors who lent their voice talent to the film. You can also watch the backstage video, in which the three answered questions from reporters and discussed the film’s enormous success worldwide. They re-emphasized their commitment to telling a story free of cliches. They also addressed the current John Lasseter situation, explaining their hopes for creating a safer environment with integrity, and making Pixar a better place for people to create art. 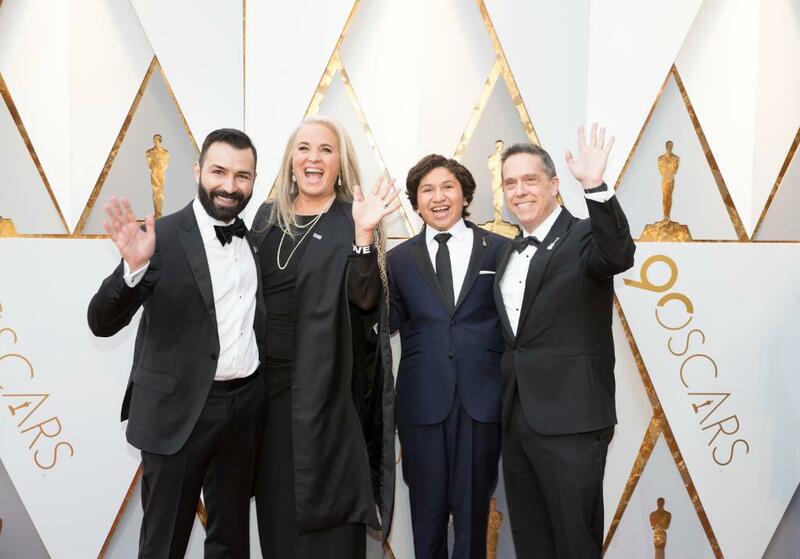 As Adrian Molina said, Coco is an encouraging film, for himself and the rest of the crew who worked on it. By creating an environment that prioritizes and includes more diverse voices, Pixar is taking steps to become better, and hopefully this will lead to even more positive change. Congratulations to Lee, Adrian, Darla, and the entire cast and crew for their Golden Globe win! Be sure to check back here for more awards show coverage. Coco has won over audiences with its vivid portrayal of familial love. As much as it celebrates family, it is also a celebration of music. 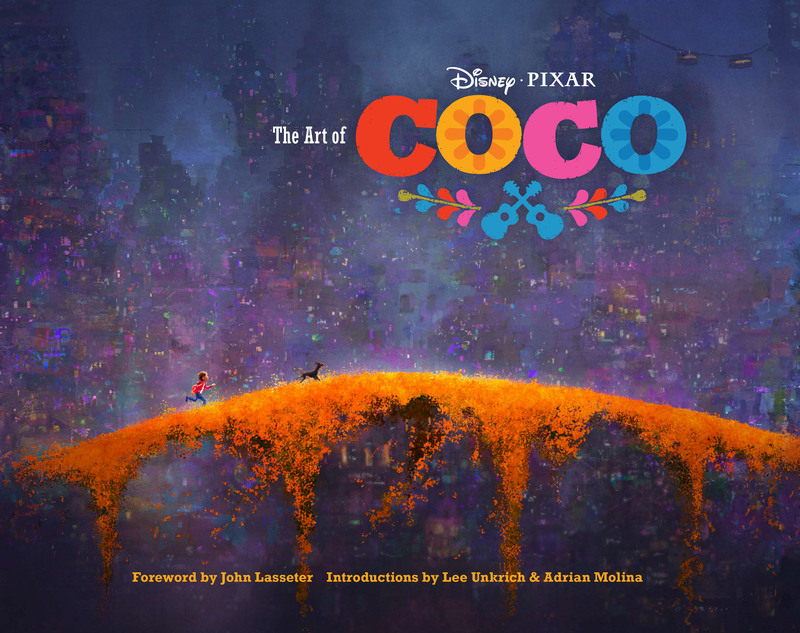 Music is intimately woven into Coco, more than it is in any other Pixar film. This is only to be expected since its hero Miguel is an aspiring musician, but Coco‘s music is also influenced by Mexico which further sets it apart from other Pixar features. The filmmakers were committed to telling a story that eschewed stereotypes, one that painted an authentic and multifaceted portrait of Mexican people. The music would need these qualities as well. To achieve musical authenticity, songwriter Germaine Franco and consultant Camilo Lara were recruited to the team. During the film’s press day in August, we were treated to a firsthand listen, learning about the myriad ways music blended into the film. And that musical presence springs directly from Miguel’s secret dream. There are three types of music to be heard in Coco. The source music was very important, as it pulled from Mexico’s broad tapestry of traditional music. Mariachi is one example that figures prominently within the film. Original songs inspired by Mexican music were written by co-director Adrian Molina, along with Franco, Bobby Lopez, and Kristen-Anderson Lopez. “Remember Me,” Ernesto de la Cruz’s most famous song, is a show stopping spectacle that recalls the glamour of Mexico’s Golden Age of cinema. Franco also noted that the song continuously reinforces the film’s theme of remembering our loved ones. The energetic “Un Poco Loco” with lyrics by Molina has a middle section which includes instrumentals only. This is one of the ways in which Lara’s purpose to create music that smells like Mexico was achieved. Then of course is the score which encompasses character themes, as well as conflict and setting. Michael Giacchino is one of Pixar’s most cherished collaborators. Coco marks his sixth film in this partnership. He detailed his process in composing the score, which began after he watched the film. It was a very emotional experience, not least because it brought him back to his childhood. Giacchino grew up listening to Mexican music, which he described as very melodic. Incorporating that sound into the score was a priority. Giacchino is Italian, but the idea of family is so incredibly strong that he connected to the story, and the same is true for non Mexicans who have embraced Coco. Authenticity is key in Coco, right down to the smallest details. The way Miguel strums the guitar had to be accurate. Pixar’s animators were praised as well for their attention to detail and making the guitar playing correct. The gorgeously designed guitar appears below. And it was this guitar that Federico Ramos (pictured above) played! As Giacchino said, the guitar was the only way to play the music of the film. To learn more about the songwriting and scoring process, watch the featurette below. You can also catch a glimpse of the many musicians whom Franco praised for adding their own artistry and spirit to the music. Though Coco details death and the afterlife, it’s a lively film and the music lives and breathes too. Coco is the #1 movie in Mexico of all time. Besides setting unprecedented box office records, it’s also become one of the country’s most beloved films. Following the film’s premiere at the Morelia International Film Festival at the end of October and its general Mexican release on November 2nd, many expressed enormous gratitude to directors Lee Unkrich and Adrian Molina for what they achieved. Coco was always going to be important. It’s Pixar’s first feature length film with a nonwhite protagonist, the first to portray a non-American/nonwhite culture, and is described as a love letter to Mexico. Naturally, Unkrich and his team were responsible for telling this story in the most faithful and positive way possible. He took that responsibility seriously, noting that he didn’t want the film to feel as if it was made by an outsider. Molina and the rest of the crew’s Mexican backgrounds certainly helped a great deal in that regard. Steeped in the rich traditions and customs of Mexico’s Dia de Los Muertos holiday, the heart of Coco beats with tremendous love and life. 12 year old Miguel Rivera (a stellar Anthony Gonzalez in his film debut) is convinced that his family is the only one in Mexico that hates music. And he’s right. It’s inconceivable, but the Riveras believe music is a curse, ever since Miguel’s great-great grandfather walked out on his wife and daughter to pursue a music career. For generations, no Rivera has ever listened to or played music — until Miguel that is. A self taught guitarist, he dreams of being like his legendary idol Ernesto de la Cruz (Benjamin Bratt), Mexico’s most famous and beloved singing star. But of course, he’s kept this passion a secret from his family, especially his grandmother, Abuelita (Renee Victor). As the Rivera family’s loving but formidable matriarch, Abuelita is the primary enforcer of the music ban. Miguel and no one else would dare cross her. It was Miguel’s great-great grandmother Mama Imelda (Alanna Ubach), furious over her husband’s desertion, who banned music from the Rivera household. To support herself and her daughter, Coco, she made shoes. And she passed this skill down to Coco, who in turn passed it down, until everyone in the Rivera line joined the family business. It’s clear very early on that Miguel is never going to be a shoemaker. He is finally emboldened to seize his moment (de la Cruz’s mantra) and reveal his ambition to his family, who are shocked and upset that he’s disobeyed them. But he is desperate to prove himself a real musician like his idol and perform in a talent show that’s being held on Dia de Los Muertos. Miguel not only seizes his moment but de la Cruz’s guitar as well, on display in his mausoleum. After joyfully strumming the guitar, Miguel becomes invisible to the living, emitting a rosy orange glow, only visible to his companion, the street dog Dante, and the dead. Because it’s Dia de Los Muertos, spirits have all converged on the cemetery to reunite with their living loved ones. It’s here that he meets his family, the dead Riveras. This is not a fuzzy family reunion however. Though Miguel is awed to be in their presence, they quickly conclude that his sudden appearance to them is the reason Mama Imelda is unable to cross over to the Land of the Living; not a good thing. Now the adventure begins, as Miguel journeys to the Land of the Dead, and learns the truth of his family history and ancestry. This world is easily one of Pixar’s most staggering in scope and beauty. The shimmering marigold bridge that connects the two lands, the skull imagery on buildings, Ernesto de la Cruz’s grand palace and the sheer amount of vivid colors practically defy description. Color sings in the Land of the Dead, best represented in the alebrijes, animal spirit guides with bold, deep hues of red, orange, green and other dazzling colors and patterns. The most glorious of the spirit guides is Mama Imelda’s Pepita, a large and powerful winged cat who is sure to take your breath away the moment she appears onscreen. Coco is brimming with a cast of fully realized characters, alive and not, human and not. Miguel is such a wonderful addition to Pixar’s heroes; passionate, brave, and soft hearted. The skeletons are impressive because they are animated with the same expressiveness as their living counterparts, and actually seem like real people who once lived. One of the skeletons that Miguel befriends on his journey is the amiable and mischievous Hector (Gael Garcia Bernal), who’s fallen on hard times and is desperate to visit the Land of the Living. The two strike up a bargain: Hector helps Miguel meet de la Cruz, and Miguel helps him cross over. The one factor complicating things is Miguel’s limited time: if he doesn’t receive a family member’s blessing by sunrise at the end of Dia de Los Muertos, he’ll become a skeleton himself and will not be able to return home. And now, the music! Music is embedded into this story. 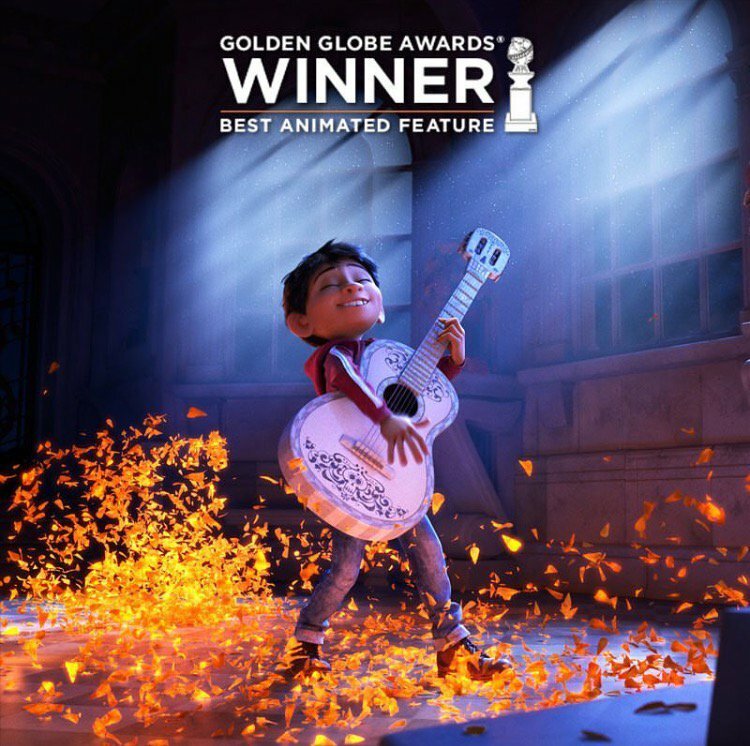 Although Coco is not a traditional musical, the characters do sing, and memorable tunes penned by the songwriting team of Robert Lopez and Kristen-Anderson Lopez, along with co-director Molina, make this film a compelling ode to music. “Un Poco Loco,” “My Proud Corazon,” and particularly the reworking of de la Cruz’s signature “Remember Me,” sung by Miguel and Natalia Lafourcade during the end credits, are standouts. Michael Giacchino’s ethereal score is yet another to join some of his most distinct Pixar work. The score is also infused with traditional Mexican music and instrumentals. A mariachi band even plays over the Disney castle and logo at the film’s beginning. Olmos is right. I left the theater feeling immensely moved, thinking especially of two recently departed loved ones. I wondered about those who died before I was born or before I could really know them. And I was reminded about how important it is for me to love and appreciate the family I have with me now. I am profoundly grateful to Coco for its impact on me, and that it has become a source of pride for Mexican people. Imagine the children who will see themselves reflected in Miguel and know that they can be the heroes of their own stories, and feel proud in their brown skin. For Pixar to celebrate Mexican identities is a very beautiful thing, and I hope this means more of the same with other underrepresented communities in the future. Click here to read reviews of the film from Latino perspectives. Coco is now playing in theaters nationwide. Let it into your hearts and share it with your families this weekend. Today, Coco is now officially one month away from release! However, the film had its grand debut at the Morelia International Film Festival this past Friday. As we previously reported back in July, Morelia was most deserving to hold the premiere, as Coco is a love letter to Mexico. The film will premiere to the rest of Mexico on October 27th. We compiled some of the mini reviews of the film in last week’s round up post following the wrap party. Now the latest reviews are in post Morelia, praising the film’s strengths and thoughtfully examining the shortcomings. We strongly recommend reading these first reviews, as they provide ample reason to anticipate Coco even more. Highlights are included below. While there aren’t any major spoilers, we’d advise not reading Variety’s review if you’d rather be surprised when the film opens next month. As reported by Variety, Coco was met with a strong emotional response. Lee Unkrich spoke of the tearful gratitude the film elicited from the Mexican audience at Morelia, noting “That was the biggest thing: people were just so proud, they expressed to us that we had gotten it right, that we had made a respectful, accurate job.” Filmmaker Carlos Cauron, also in attendance with his brother Alfonso, expressed his hope that Coco would be a worldwide box office success. Read more about the Morelia Festival here, which takes place in a city renowned for its Day of the Dead celebrations. We’re more than heartened to hear that this first audience has embraced Coco so enthusiastically and that the film is a source of pride. We hope you’ll join us in eagerly awaiting the film on Thanksgiving! Alas! A brand new clip has been released from Coco, Pixar’s upcoming film. It’s a brilliant clip, but it’s also full of a few spoilers. You can watch the clip at the link below, in one of Pixar’s recent Tweets. In the clip you will see a charming little musical number done by Miguel, some more gorgeous designs of the Land of the Dead, and Miguel FINALLY interacting with Ernesto de la Cruz. Pixar, you’re killing us with these clips! Luckily November 22nd is almost a month away! There are two elements of the filmmaking process that Pixar prioritizes above all else – story and research. They are famed for both, and Coco is the latest film to rely extensively on research. As they did in 2012 with Brave, a team was assembled for a research trip, this time to Mexico. A new featurette was released yesterday about the Mexico trip and demonstrates their commitment to authenticity. Watch the video below. But that’s not all! You can also watch the “Mariachi Plaza” scene that features Abuelita in all her fearsome, chancla wielding glory! This is an extended clip that’s appeared briefly in earlier trailers and videos. Although Abuelita dominates this scene, Miguel earns our sympathy as he wistfully shares his dream to someday become a musician. Both of these clips succeed in communicating Pixar’s dedication to research and story. Keep an eye out for more previews!